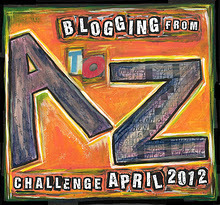 This is my first post for the A-to-Z Challenge. Through the alphabet, one letter per day (excluding Sundays, except today). I’ve chosen a theme of terms related to the arts, which can also be applied in some way (sometimes with a bit of a stretch of the imagination) to writing. As you read my posts day by day, you’ll encounter terms from theatre, film, music, dance, the visual arts. I’ve learned all kinds of things as I’ve searched out words — I hope you’ll enjoy what I’ve found, and perhaps learn something, too. Actors have traditionally been the chief proponents of the Alexander Technique, and there are many well-known names in lists of those who use the technique. Musicians also find it helpful — and so can writers. Writers spend a great deal of time in one position, which can become a cramped and stiff position all too easily. Whether writing in the traditional pen and paper method, or using a computer, there are often curved shoulders, tight backs, tired wrists — all problems which can benefit from learning and applying the Alexander Technique. The online “Complete Guide to the Alexander Technique” has an excellent overview, and a listing of some of those who have found the technique helpful — including such notables as George Bernard Shaw and Roald Dahl. There is also information on that site about how to find a teacher/practitioner in your area, and some suggestions for learning the technique on your own. ADDITION: Thanks to Jo Ann who posted some very helpful links in her comment, I want to point all who use computers to Imogen Ragone’s Body Intelligence blog about the Alexander Technique, in particular her posts on computer use! Have you used the Alexander Technique or some other similar method? Interesting Beth! A hereditary back suffer from way back, and to avoid serious surgery for a bad case of siatica, was introduced to Alexander Technique. Never thought of it for writers…mmm but then I do use a lumber roll, when sitting for long periods. 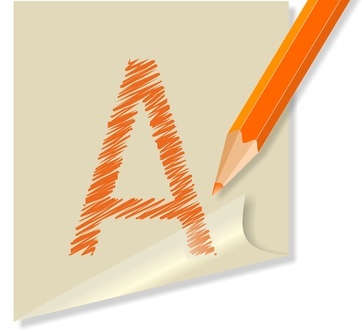 Congrats on your first A-Z Post. Thanks Diane, for this endorsement of the Alexander Technique! Glad to hear you use a lumbar roll — good suggestion. Wow – I have never heard of this, but bookmarked the page you referenced. I sit for long periods and could use a technique like that. I hope you’ll find the Alexander Technique helpful, Lynn, and I hope you’ll be back! I just clicked to follow your blog. Your piano-parts Angel is a joy, and indeed is Bella! It’s hard to remember to align the spine! Glad to have introduced you to something new! What a helpful post, Beth – thanks for sharing! I may need to try this for my wrist. Well, I should try this for my wrist. I had never heard of this. It sounds fascinating. I have a variety of exercises I use to keep my body moving. Sitting too long is hard, and the repetitive stress on one’s wrists and arms is tough. Glad to have introduced you to something new, Rob-bear. Enjoyed your post about aardvarks! This is going to be a really interesting month and if I’m not careful I might actually learn a thing or two. 🙂 What a great start! Thanks, D.L. I have a feeling we’ll all learn quite a bit from visiting each others’ blogs! Thanks for dropping in, hope you’ll come back. Thanks, Cindy — I’m glad to have introduced you to something new! Interesting. I’ve never heard of that before. Sounds like a good idea. Glad to have introduced you to the Alexander Technique. Your posts are going to be such fun! I have used the Alexander Technique with my acting, not with my writing. I look forward to trying it out soon! I have found in addition to the posture benefits, it also helps me sink into character. I imagine with fiction writing it might do the same. Grand to meet you as a part of the #AtoZChallenge! Thank you, Julie — and fascinating to learn that it helps you sink into your character in acting. Great to meet you, too! How cool is this? I would imagine that there is not only a physical nature to it, but also a creative one where perhaps writing out of your genre may help to “free up” some creative thoughts/words/actions that were lost as we grew out of childhood. Looking forward to reading more about this. Thanks Beth! Oooh, I love the way you’ve extended it to the creative realm. Thank you, Tracy! Very interesting, Beth! I know someone who runs a whole program using this technique – I think mostly with music. She’s been very successful! Thanks, Jarm. You enjoy the challenge, too! Interesting. I’d never heard of it before. Great start to your blogging challenge! Thanks, Julie. There may be a few things I blog about that are even more obscure this month. Hope people will enjoy them, and get something out of them! I’m glad to have taught something today! Isn’t that the coolest thing. Anyone who is on the computer for long periods of time must have poor posture. I struggle with sitting properly so that I won’t have back issues. I’m failing. It sounds as though you might find the Alexander Technique helpful, Teresa! What a great “A” post! Believe it or not, it ties in with my A to Z post today about acting. 🙂 Can’t wait to see what else you have in store! Thanks, Shannon! I’ve checked out your blog, and it does indeed tie in with your post! Cool! This is so interesting! I have never heard of it before, but it sounds awesome. I need to keep this page in the bookmarks for future reference! So glad you shared. Thanks, Leigh. It seems I’m introducing quite a few people to the Alexander Technique today! Thanks so much for sharing! I’m constantly correcting my posture when I sit for long periods, and I’m a long-time back pain sufferer. Looking forward to more of your posts! You’re welcome, Dawn! I hope the rest of my posts will provide something to pique your interest, as well. I’m glad you chose the Alexander Technique for your letter A! I was first introduced to the Alexander Technique several years ago and my experience with it was so transformational that I trained to become a teacher of the Technique myself. Many people outside the world of the performing arts have not heard of the technique, and many could benefit from learning its principles. For those who have commented here, there is quite a bit of information on-line about the technique. An excellent site is http://www.alexandertechnique.com where you will find a variety of resources. For those you you who work long hours at the computer, my colleague Imogen Ragone has just written a series of blog posts that you may find helpful: http://www.imogenragone.net/blog. Of course, the best way to experience the Alexander Technique is to take a lesson with a certified teacher. To find a teacher near you, go to http://www.alexandertech.com. Jo Ann! Thank you so much for this comment packed with information and resources! I appreciate it so very much. Very helpful post Beth. Never heard of the technique and I could certainly benefit from spending so much time writing. Make myself get up and move and have created my own techniques, but this sounds helpful. Thanks. You’re welcome, Pat. I don’t know if you noticed, but Jo Ann who commented just before you shared a link to some fantastic ways to apply the Alexander Technique to the problems associated with computer use. I love learning new things. This is an interesting topic and I am looking forward to learning more throughout the month. I’m glad you’ve enjoyed this one, Melissa — hope the rest of the month is enjoyable, too! You’re welcome, Laura! I’ve been very excited by some of the comments linking the Alexander Technique to benefits for both extended computer use, and for creativity! There will be more on this on my blog in June. I’m a writer who also is qualified as a teacher of Alexander Technique. I find that improving my own ease of movement also gives another by-product – good ideas. Somehow moving my body easier allows the creative juices to get up to my brain easier. It makes sense, since the mind and body are interconnected, that if you influence physical effort, other benefits follow suit. This is what makes the Alexander Technique sound as if it’s snake oil – good for whatever ails. It’s also one of the few areas of study that help your ability to describe the indescribable – ( a writer’s dream!) It offers the ability to observe yourself and human nature in general, which is also indispensable for a creative person. Anyway, the easiest way to start getting benefits, (even without an A.T. teacher,) is to religiously take a five minute break every hour while laying on your back on a firm surface with your knees up…whether you “need it” or not. ;o) Unless this position is painful at the start, (which means you need to start with the advice of an A.T. teacher) I guarantee that doing this “semi-supine” break regularly will help your artistic productivity and comfort. When I first started with doing these semi-supine breaks, I got an extra two and a half hours of work out of myself without knowing how to do anything else. Thank you SO much, Franis, for these additional ideas. This is wonderful. P.S. I’m delighted to have found your blog through your comment here, and am now a follower! I’ve heard of this technique before, Beth, and did start doing some Pilates with this in mind. Have you tried it yourself? My intentions have been better than the reality thus far, but with all the links to additional information, plus the incentive of added creativity, I am definitely going to make it a regular practice. I’m glad you wrote about Alexander! I just started lessons in December because of back pain while in my art studio, and also while at the computer. Learning ease is wonderful, and that I don’t have to “make something happen” but let it happen. Before I started making mosaics, I was a poet, and I once met an actress who told me that it seemed like writers didn’t have bodies, that they ignored them, and that really resonated with me in the sense that I’d often freeze into one position while writing. Thank you Margaret! I can certainly identify with the idea that we as writers are not aware enough of our bodies. I, too, often find I’ve been in the same position for far too long. I’ll be doing an interview with an Alexander Technique teacher in June — hope you’ll come back for it!